A long sweeping beach that stretches for a couple of kilometres, Livadia is the most popular beach on the island and the best organised. Located close to the main port, it’s a relatively narrow beach, dotted with tamarisk trees that provide welcome shade in the stifling midday heat. The beach is mostly pebble with a little sand, so swim shoes are advisable as is something padded to lie on. However, the lack of sand means the crystalline waters are ideal for snorkelling. As the main island beach, Livadia has the best facilities with a few places offering sunbeds and umbrellas for hire, and a number of cafés and tavernas lining the coast. Although one of the busiest beaches, it’s still relatively tranquil, especially since the road was diverted and transformed into a peaceful walkway. Eristos is possibly the most famous beach in Tilos. Located a few kilometres south of Megalo Horio, it’s a beautiful kilometre-long stretch of sandy beach, fringed with trees. There are a few facilities here – a handful of tavernas serving hearty food, a cantina in the height of summer, and a complex that offers sunbeds and umbrellas. But it’s mostly a peaceful haven of tranquillity, a little off the beaten track. The only exception is during August when the beach takes on an alternative vibe with people camping under the trees. But even then, there’s plenty of space for you to find a quiet spot. It’s worth noting that the far end of the beach tends to be a nudist area, and the water can feel cooler in places as a number of springs run into these waters. There’s a regular bus service between Livadia and Eristos. Agios Andonis (or Agios Antonios) is one of the longest beaches on Tilos. Composed of sand and pebbles, it’s a lovely, clean beach and a tranquil spot to relax. There are no sunbeds or umbrellas here, although bushes and trees provide a little shade. However there are a couple of tavernas serving excellent seafood near the tiny fishing harbour. There was an ancient and Byzantine burial ground located here and, if you look closely at low tide, you may be able to spot fossilised bones in the rocky shoreline. It’s also worth having a peek in the tiny chapel after which the settlement is named, although most of the frescoes were destroyed during World War II. Agios Andonis is close to Megalo Horio on the road to the monastery of Agios Pandeleimonas. If you spend a day relaxing here, don’t leave too early – this is one of the best spots on Tilos to savour sunset. 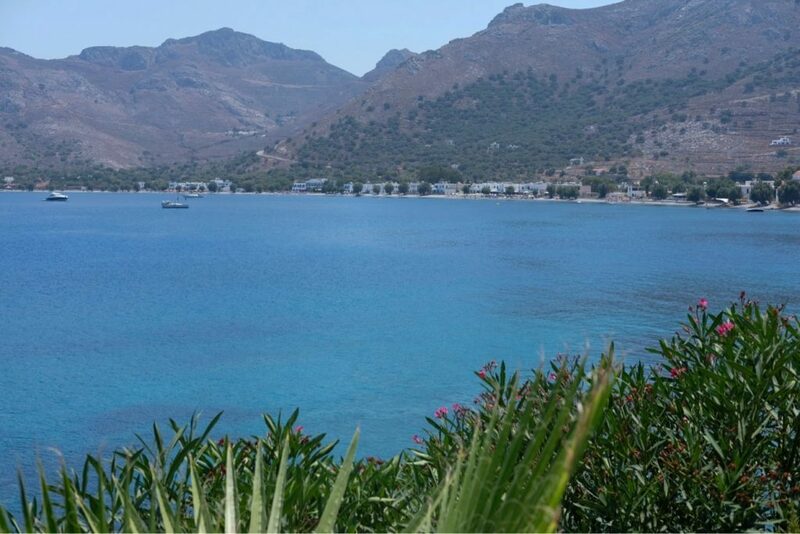 Located in the north of Tilos about an hour’s walk from Agios Andonis is the remote, tranquil beach of Plaka. This narrow sand-and-pebble beach has a rocky seabed and is backed with eucalyptus trees and the green of Plaka Gardens. There are no facilities here, so bring enough food and water with you. However there are colourful, curious permanent residents in the form of proud peacocks, which may hop over the fence to investigate your lunch and stroll along the sand. Sometimes people camp here during the summer, and the end of the beach tends to be nudist. Lethra is a charming beach, reached via a gentle walking route from Livadia. Leave Livadia at the harbour end, passing Ilidi Rock, and follow the track for under an hour, past Ruth’s Rock, a local landmark, and tiny Red Beach. Then follow a goat track down to Lethra. Lethra is a gorgeous beach for swimming and snorkelling, and outside midsummer you may be the only person there. There are no facilities so bring adequate food and water, and arrive early if you want to bag the shady spot under the sole tree. There are a number of other remote beaches that can only be reached on foot or via boat, such as Skafi, Tholos, Agios Sergios, and Stavros. 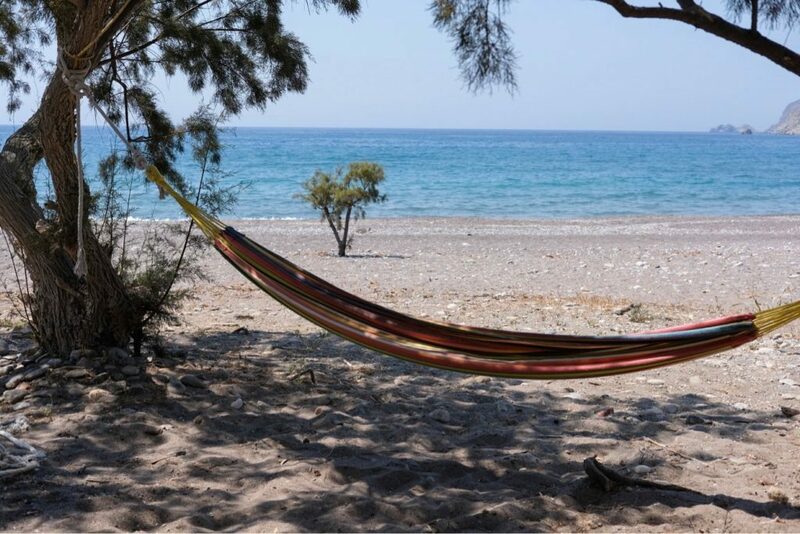 If you wish to explore these beaches, pick up a map of Tilos walking routes or ask our island representative, Ian, who’ll be happy to advise you how to reach them. If you fancy exploring the wonderful beaches in Tilos, check out our selection of Tilos accommodation. For more information or to book your Tilos holiday, contact Nissia Holidays on 01455 289421 or email us: info@nissiaholidays.com.